It is so long since I last wrote a blog post. Things have been changing all the time. 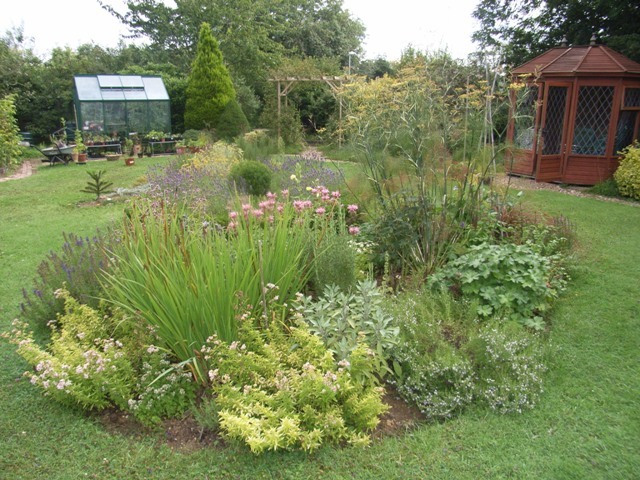 Last year we merged two beds into one for herbs, roses and wildflowers. 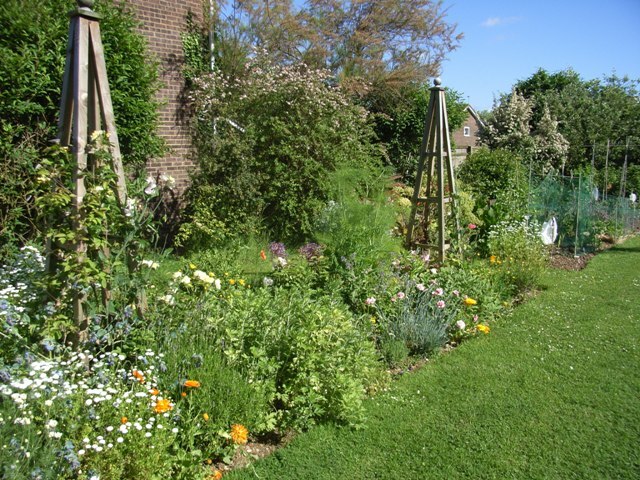 We have two home-made obelisks as the focal points, both with roses and clematis plantings. This has provided some, much needed, height into the central part of the garden. The East border improves every year. This spring it was delightful. It will need a good tidy up before next spring though. 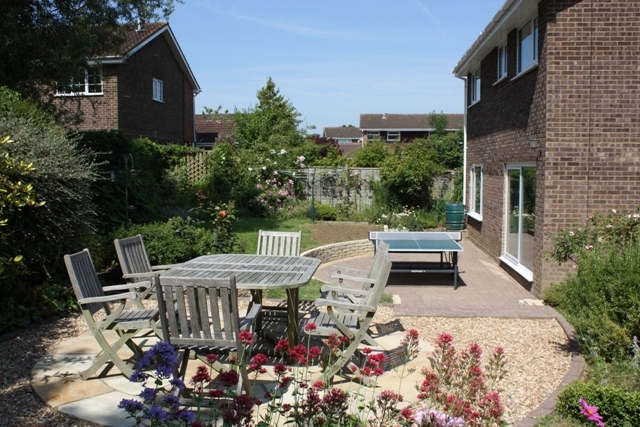 The major change this year was to our back garden walkway and the patio. The retaining wall was coming apart in some places and I had never liked the straight line across behind the house. This was it about 5 years ago. This year our excellent landscaper took away the brick patio and made a semi-circular feature behind the house using the old bricks. He then created a new patio area. It wasn’t designed for a table tennis table, but it fits jolly well. 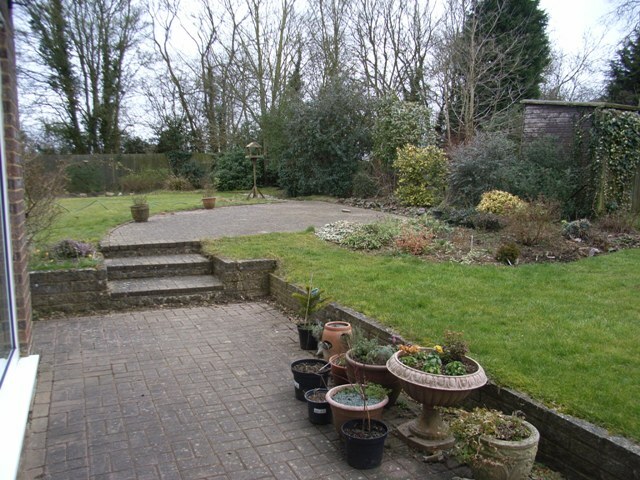 We are very pleased with the whole thing, it makes the old back garden look larger and more inviting. I went out into the garden a few nights ago and was enchanted by the silence and beauty of it with a thick covering of snow. It felt as though it was a magical land waiting for something to happen. In daylight it was interesting too, of course. However many times you see it the appearance of plants, paths and structures in the snow is always fascinating. The pond has iced over again and I couldn’t make a hole. I hope there aren’t any more frogs left in there to suffer. 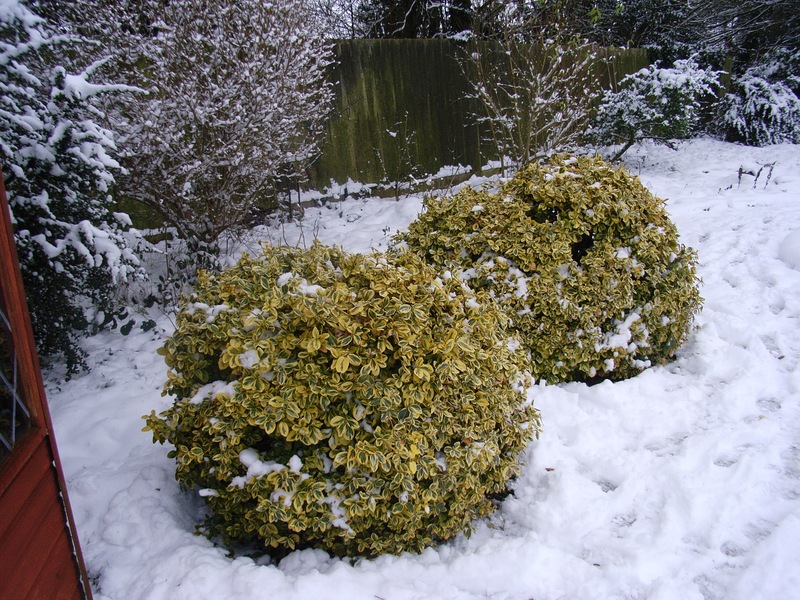 The gold-variegated evergreens provide a good contrast to the black and white look of snow scenes. 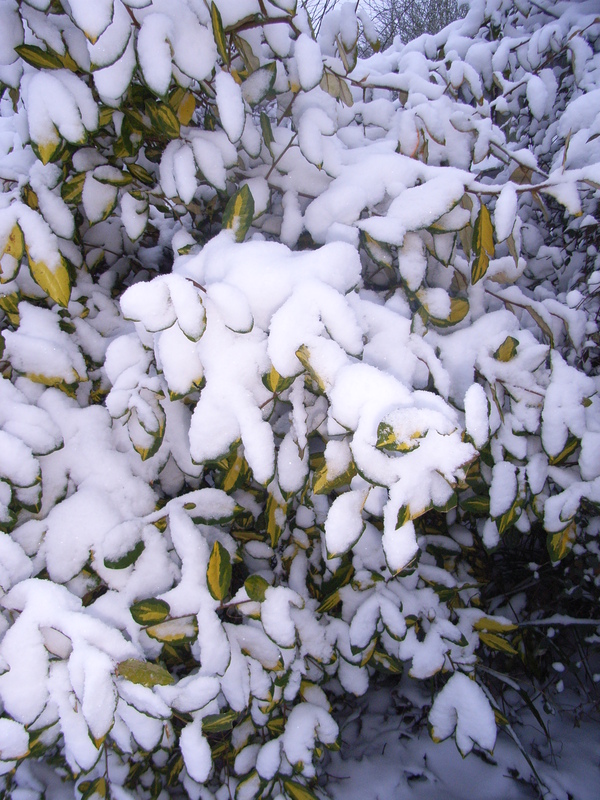 I knocked the snow off the rosemary and mahonia where the branches looked heavy enough to break. 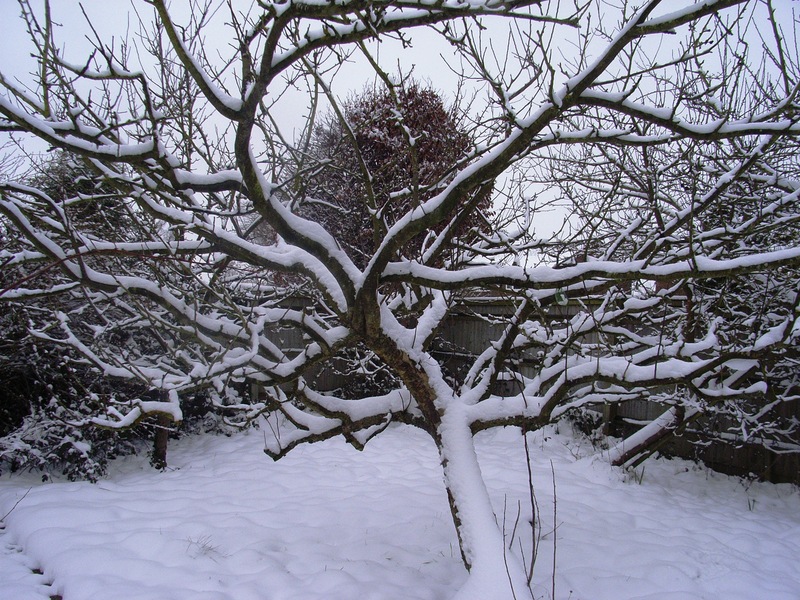 Apple trees have a particular charm with their gnarled-looking, horizontal branches. One day last week was bright, dry, and mild and so inviting for a gardener who has been kept indoors by the horribly damp weather. I tidied up the fronts of some of the borders, taking out all the dead and dying material but dared not step onto the soil as the clay is still very wet. 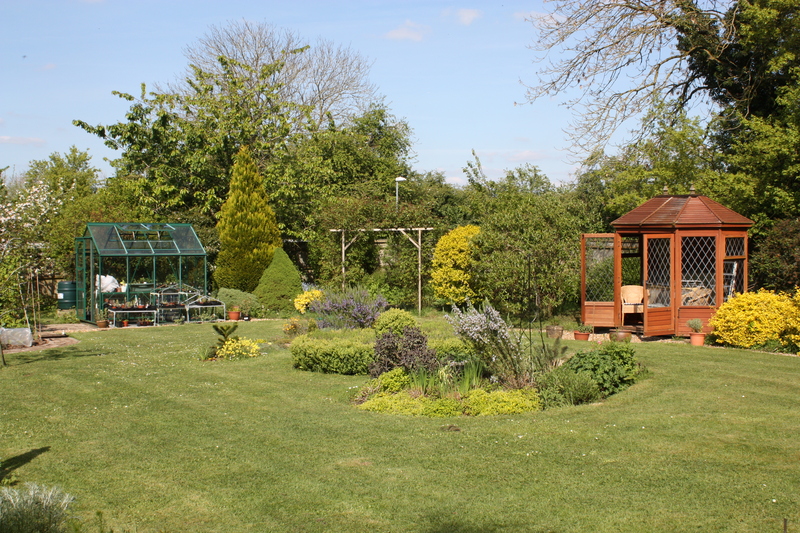 On the whole the garden is not looking too bad and the grass was beautifully green and lush. 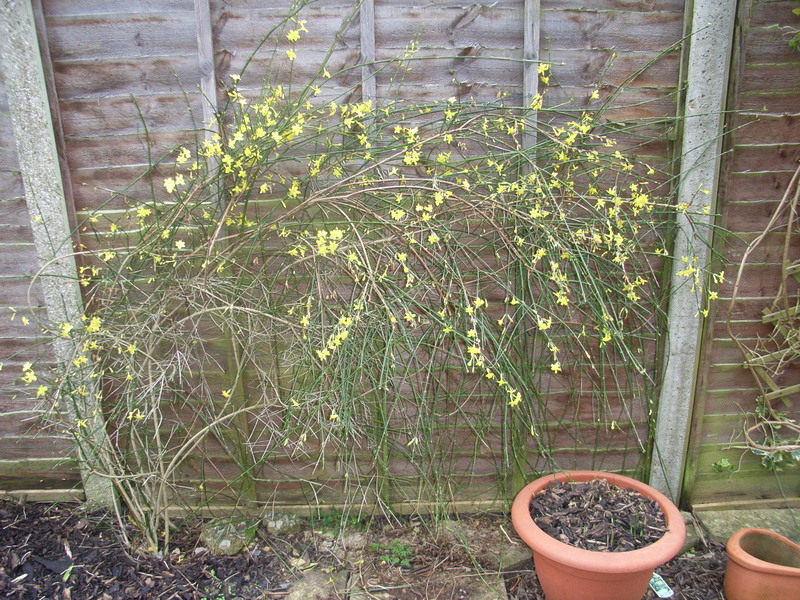 Just looking around to see what was flowering I found primulas, mahonia, Viburnum tinus, and the delightful Winter flowering jasmine. 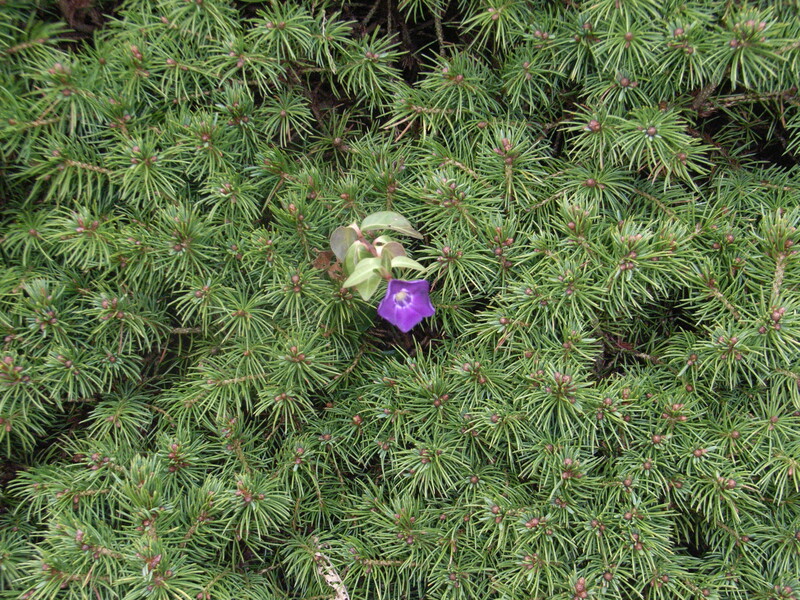 I was surprised to see a mauve flower growing out of the picea, which turned out, on close inspection, to be a climbing bloom of Vinca minor. Last week I ventured out into the sodden garden after a few days of drier weather. Walking around by the pond I was horrified to see 7 dead, bloated, frogs floating in the water. I have seen one or two like this after a cold patch, when the pond freezes over, but not more. We wondered if it was our radical clearing out of the pond in October that had somehow left them vulnerable. 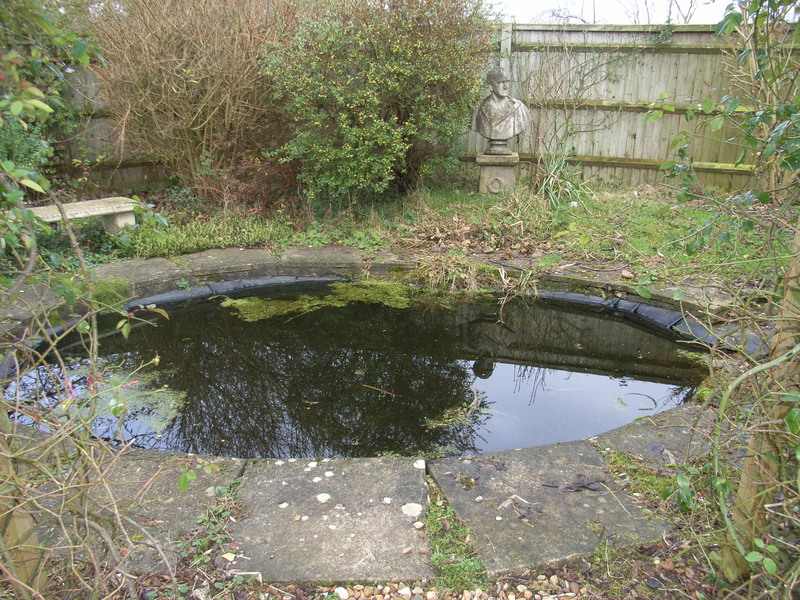 Having taken advice from the organisation called Pond Conservation, it seems that we wouldn’t have done much harm with our clear-out, quite the reverse really. It is most likely that they did suffer when there was a cold snap a week or two before Christmas and then took their time to float to the top of the pond. 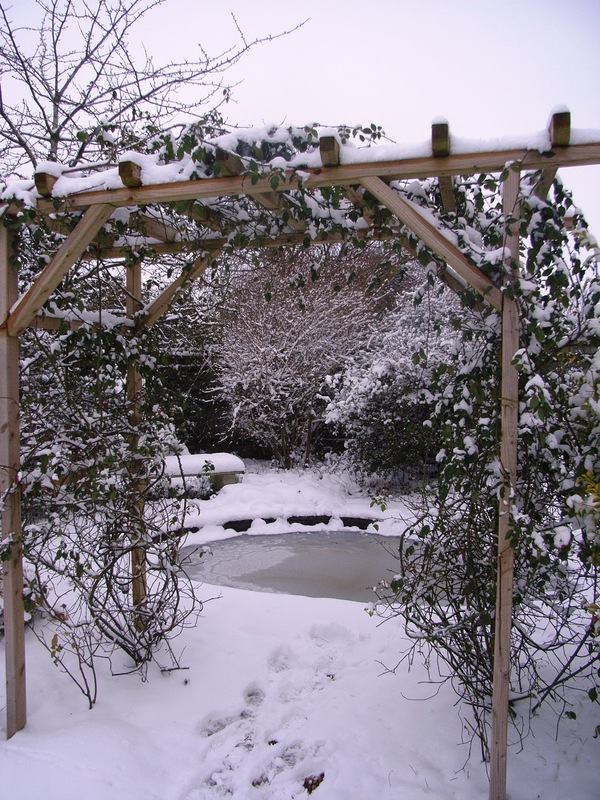 I hadn’t tried to keep a patch of water clear of ice this season, so I must remember to do this in the future in order to prevent any build-up of noxious gases. I really do hate my frogs to be hurt! I have had a lovely morning in the garden. The weather is warmish and with hazy sun. The dew is prolific. 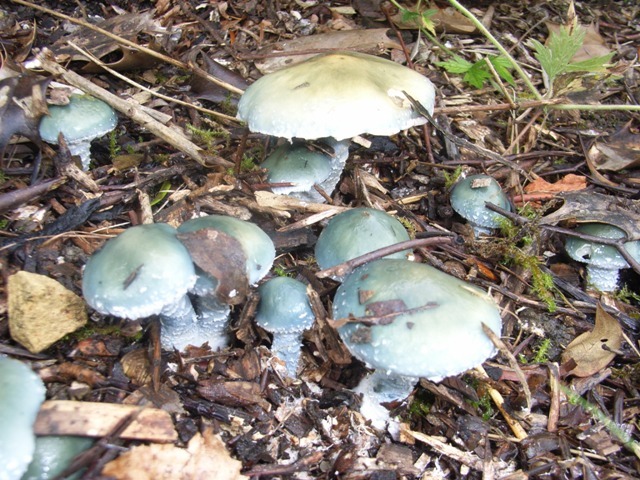 It took me a while to identify it using ‘Roger’s mushrooms’ website, which I can recommend for its useful search feature and the helpful pictures uploaded by members. Interestingly one of the pictures uploaded was from Milton Keynes, quite close to us, and looking absolutely like mine so I am sure it is identified correctly. I then spent some time trying to reduce the population of lungwort (Pulmonaria officinalis) in a border. This plant is so useful for spring colour and ground cover but sometimes it gets a little out of control and it was swamping everything else. The self-seeded hellebores and the High Sheriff roses now have space to grow. Following this I needed a less demanding job to finish the morning. 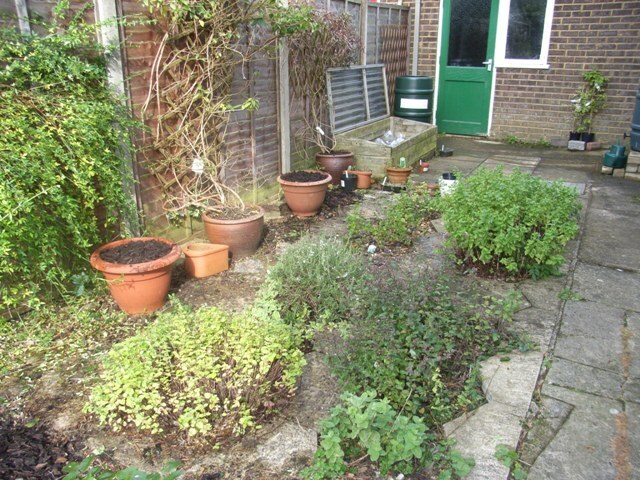 I pulled the weeds out of two pots, near to the kitchen door and behind a herb area, which have some spring bulbs in them. I added Iris reticulata ‘Harmony’ to one and Narcissus ‘W.L.Milner’ to the other, so I will have more February to March colour right outside the kitchen window. I already have a patch with the delightful and ubiquitous Narcissus ‘Tete a Tete’, which is a bright yellow, so ‘W.P.Milner’ with its pale yellow flowers will be a good contrast. 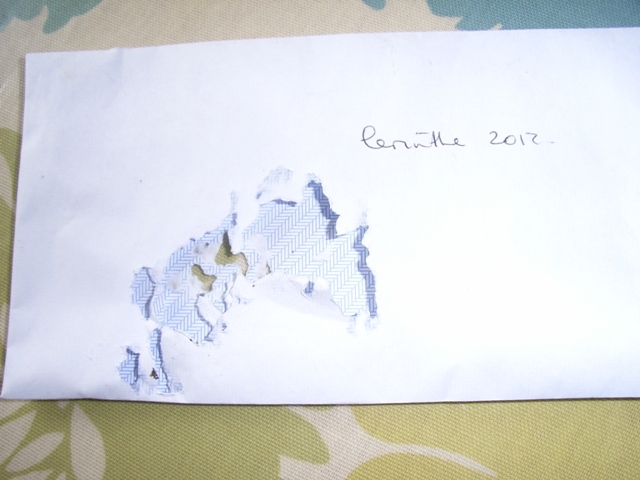 Yesterday I had sown some Cerinthe seeds in the greenhouse and today when I went in I found that mice had eaten a hole in the packet. They had munched through quite a few packets, so all the seeds are now safely in the house. It is rather touching to think that the greenhouse is mine in the day and theirs at night, although it won’t be quite so interesting for them now. The other day I was having one of my morning wanderings in the garden, with a cup of tea in one hand, when I accidentally brushed against the lemon balm (Melissa officinalis). Instantly I remembered my first attraction to herbs and lemon balm was one of those early charmers. In fact I think its scent is the most beautiful of all. However, I have paid it no attention at all this year while my mind has been on propagating the more popular and easy to grow herbs. When I say ‘easy to grow’ I don’t, of course, mean that lemon balm doesn’t grow quickly, and lusciously but that it is very difficult, for an amateur at least, to keep it looking healthy enough for someone to want to buy it. It succumbs to rust very easily indeed and I have never had a bush without that affliction. At this time of year, with its tiny flowers out, or having gone to seed, it is well past its best. I always mean to have at least two plants of each kind so that I can keep one well clipped and let the other do its own thing, but I haven’t got there yet. And what of lemon balm’s other charms? Margaret Brownlow in her book ‘Herbs and the fragrant garden’ suggests making a tea using one part lemon balm leaf to two parts of tea leaves. I haven’t tried this but I can imagine it would be good. I do use lemon balm with mushrooms, where it provides just the right zing, especially in an omelette. I also put the leaves in my salads. Lemon balm is otherwise known as bee balm. The name Melissa originates from the Greek word for the honey bee and bees do love this plant. Gerard, in his ‘Herball’ says ‘The hives of bees being rubbed with the leaves of bawme, causeth the bees to keep together, and causeth others to come unto them’. 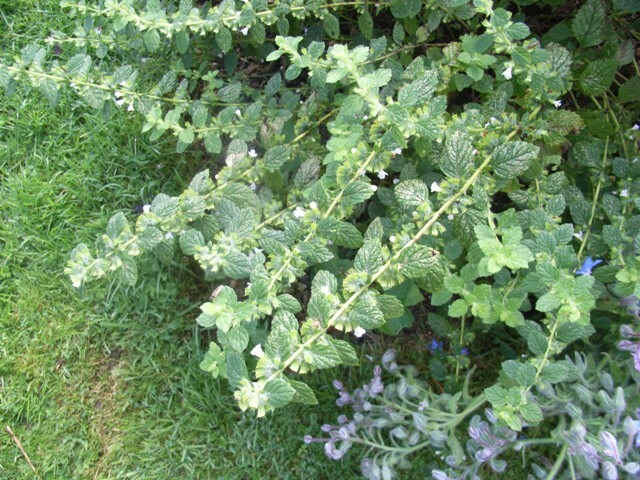 In addition to all this lemon balm is traditionally known and used as a cure for melancholy. When I look around the garden at this time of year I see some of the real stars performing at their best. Box, lavender, repeat-flowering roses, sedums, primula, and Japanese anemones are probably the most notable. The soil here is heavy clay and although some of the beds, mostly vegetable, have been improved over the years, others have had no special treatment at all. 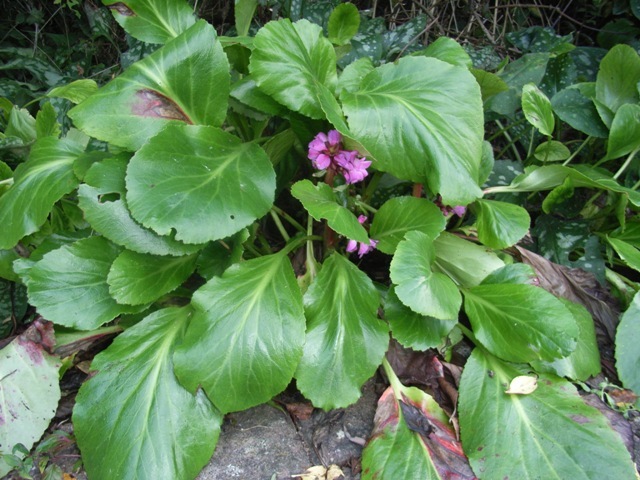 Bergenia does well here and is having a bit of a flower before the winter. 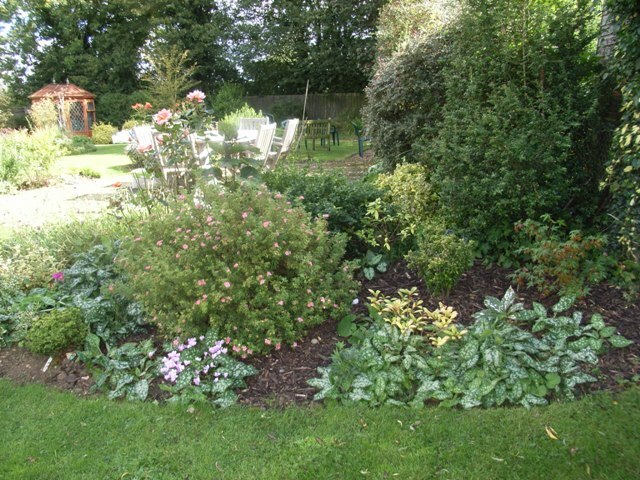 Some plants have been specatacular failures over the seven years we have gardened here, for example, Viburnum davidii, penstemon, echinacea, clematis, although this may not be entirely due to the clay soil. 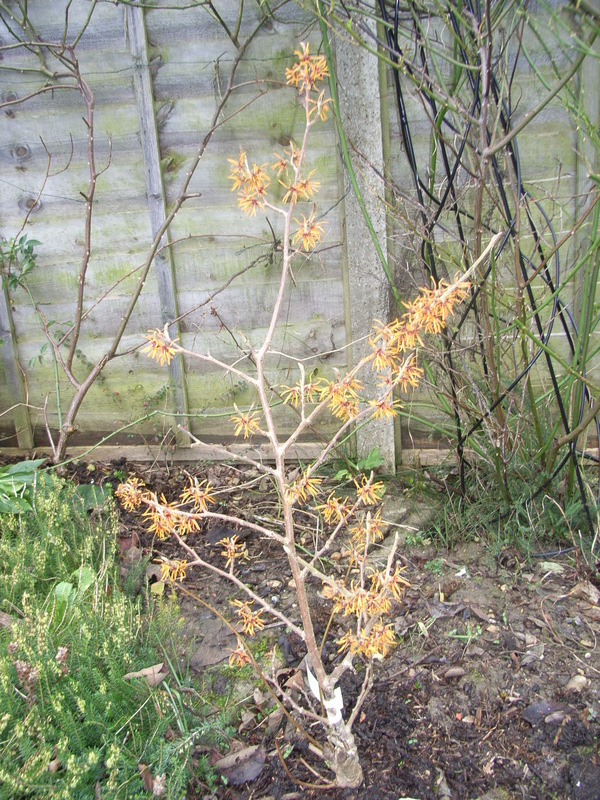 In fact, I am determined to win with clematis next year and I will have to provide better conditions for it. The Royal Horticultural Society suggests quite a small range of plants for clay soils but there are plenty that I do not currently have. I think I should treat myself to some Primula florindae, Iris laevigata, and Houttuynia cordata, and must take their advice and not plant until spring so that I don’t lose anything in the cold, damp winter. I love looking back in my garden journal and reading about how the garden performed in previous years. It is amazing how easy it is to misremember and think that last year’s crops were better than they were. In fact now that I have started this blog I am not writing in my journal as much, which is a pity, and I must get going again. 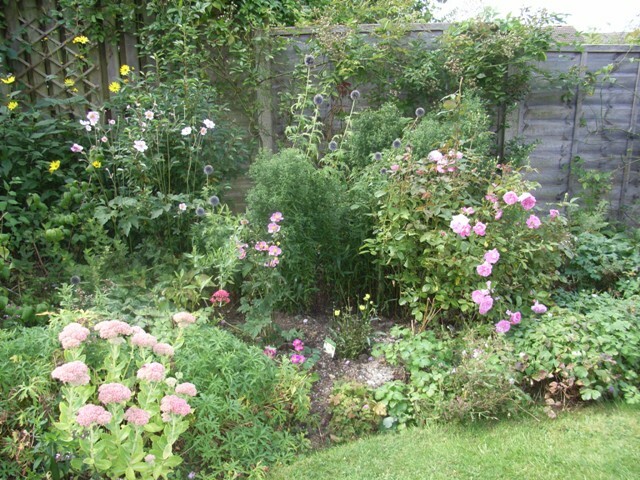 I notice that in August 2011 the weather was rather wet after quite a dry summer. Generally speaking the vegetables were good, although I recorded the runner beans as being affected by black fly and only growing slowly. The apple crops last year were fantastic and so were the plums, a green variety which is ready in early August. Most of my entry for that month was about gardens we had visited and one in particular stands out for me – Stone House Cottage Garden near Kidderminster. This is an unexpected little treasure and very quirky. The owner bought a cottage and then built follies and castellated towers around, which have created wonderful warm walls for all manner of climbing plants. 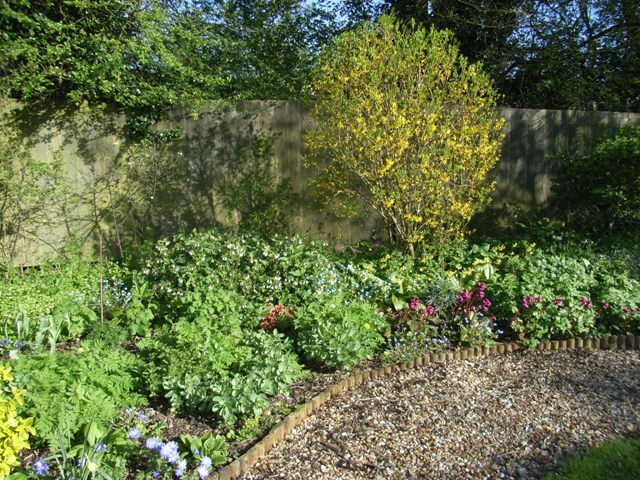 It is very much a plantsman’s garden and much of the planting was lost on me but it is very charming and shows what can be done to create different planting situations. The garden is in the RHS members handbook, the website is www.shcn.co.uk, it has a small nursery and is well worth a visit. At the end of August 2010 I recorded that ‘the drought is well and truly over’. The apple trees had not done well with only two in fruit – the Bramley and another that might be a Discovery. We had hardly any plums. So the fruit situation was similar to now, although the apples we do have this year look poor specimens. 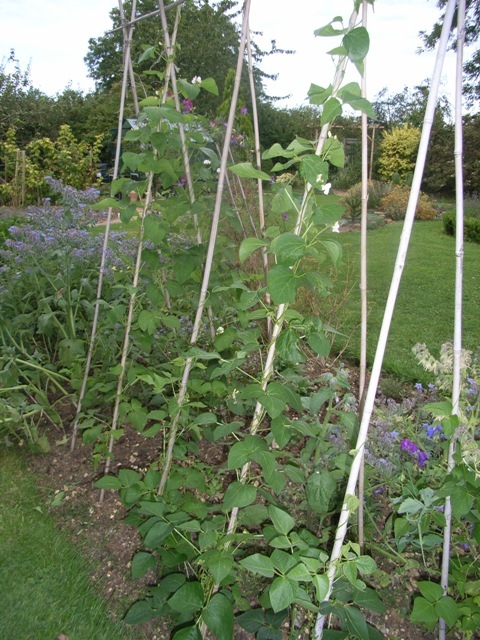 I am noticing that most years the runner beans take ages to get going and are usually afflicted by blackfly, slugs or something else but that by October they are cropping well. Plenty of time for them to improve then. We had our first 4 beans today. I just love them. 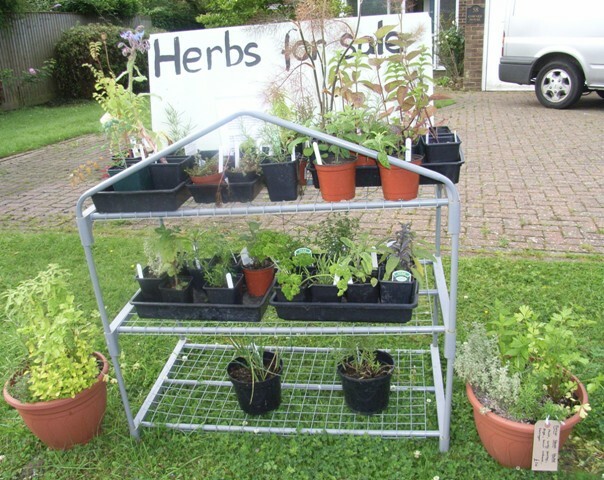 Last week after much prevarication I finally put out in the front garden a small selection of herbs for sale. I meant to do it before but finally plucked up the courage. I was amazed to find that on the first afternoon I actually sold one and then several on each of the following days. Admittedly sales have slowed in the last couple of days but I hope they will pick up again. I don’t expect to sell them every day but perhaps a few every week during the summer. I have learned a lot from buying in a small number of plug plants and growing them on this year. The fact that they grow faster the later you buy them. I bought my first lot in mid-April but the next batch, bought in mid-May, grew considerably faster. 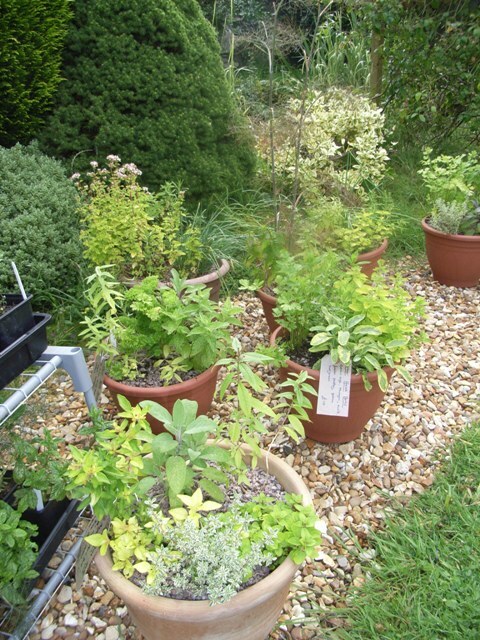 Most common herbs can go into their final pots in the garden quite early and will grow happily. Once they were out in the garden they came under severe attack from the slugs and I had to watch what was happening carefully and replace badly damaged plants, so keeping them under cover for longer does enable you to protect them from predators better. It is important to keep their growth under control and not let them get too leggy before you cut them back. You need to try and create a good, bushy shape. Some plants like mint really do look past their best about August time and need to be sold by then. 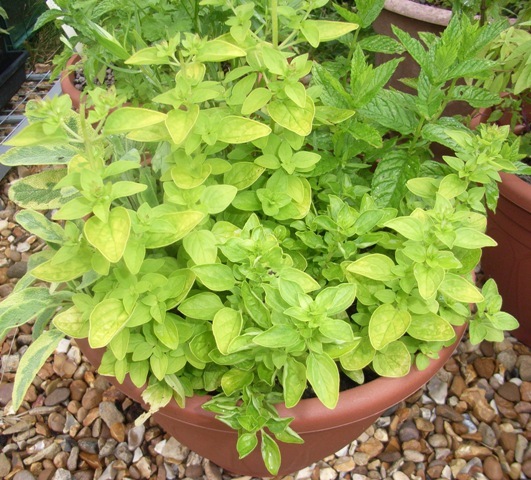 It is best to put herbs requiring the same conditions in pots together. Having said which there doesn’t seem to have been a significant problem when I haven’t done this. I am planning on having a herb sale in the garden in a few weeks. So providing I manage to sell a good number of the plants I will feel that this year has been successful and a very good learning experience. Also, when you really love what you are doing it is simply wonderful when people want to buy what you are selling. Marjoram’s Latin name Origanum means ‘joy of the mountains’. 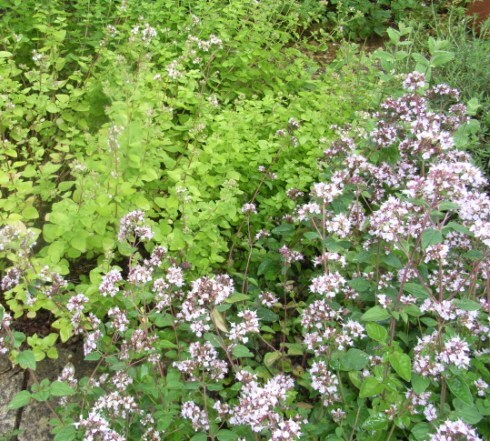 There are at least 7 different species of marjoram and many cultivars. Marjoram is a great value plant for many reasons. Bees and butterflies love it and it flowers prolifically. The flowers are not the most showy but they provide good pale pinks and whites in the border for long periods. Although it is generally recommended for dryish and sandy soils it grows like a weed on my heavy clay. 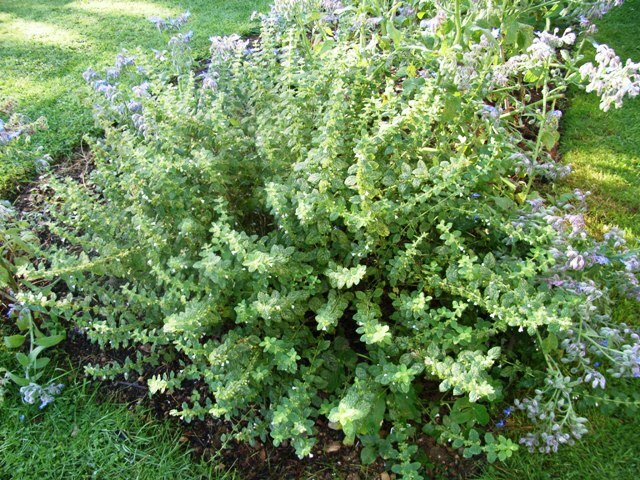 In the kitchen marjoram provides good flavour in soups, stews and salads and it can be drunk as a tisane. All marjorams, but sweet, knotted marjoram in particular, are great in cheese (especially cream cheese) sandwiches. 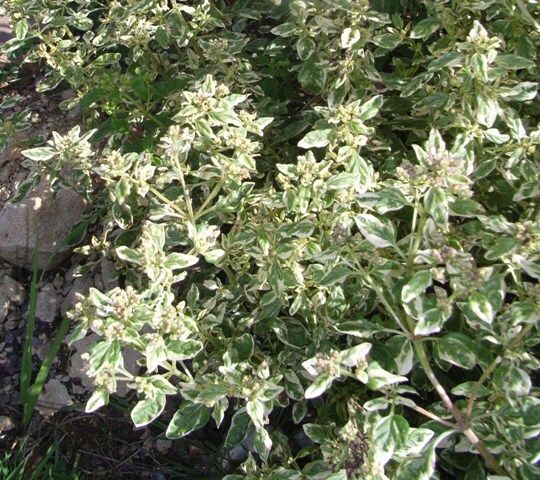 Marjoram is heavily used in Mediterranean cookery. Sweet marjoram has the best flavour in my view and Greek marjoram is also noted for its flavour. Owing to the strength of the herb all marjorams should be used judiciously in cooking to begin with. Gerard’s herbal of 1597 prescribes marjoram for those subject to ‘overmuch sighing’. Juliette de Bairacli Levy in her ‘Herbal handbook for everyone’ recommends its use for digestive complaints, sore throats and coughs. Pot marjoram (Origanum onites) seeds itself freely and will cover any gap in your border. 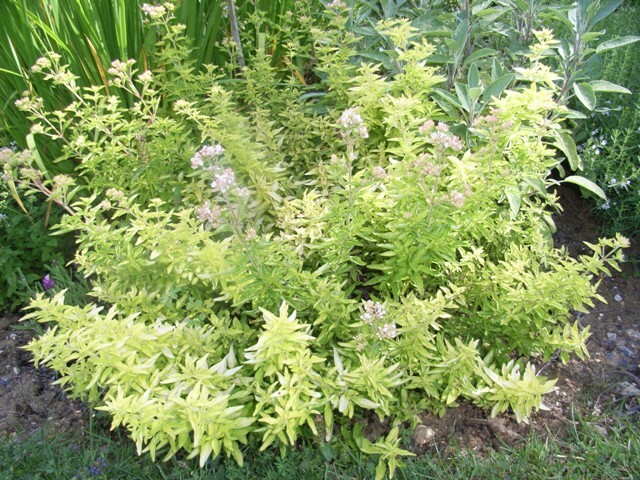 Golden marjoram is similarly useful and has beautiful yellow/green foliage making a beautiful tight clump early in the year. When it flowers it grows more leggy, as you can see above. Two particularly attractive cultivars include ‘Acorn Bank’ illustrated above and ‘Country Cream’ with its variegated leaves.